The deadline for Accretionary Wedge #43 – “my favorite geological illustration” was extended, which finally kicked me into deciding what to post. There are a number of diagrams I love that people have already used (Erik’s bubble figure, the Wooster fun with chemographic diagrams, MK’s subduction zone — which I’ve drawn on tables at Italian restaurants & on onsies at baby showers). 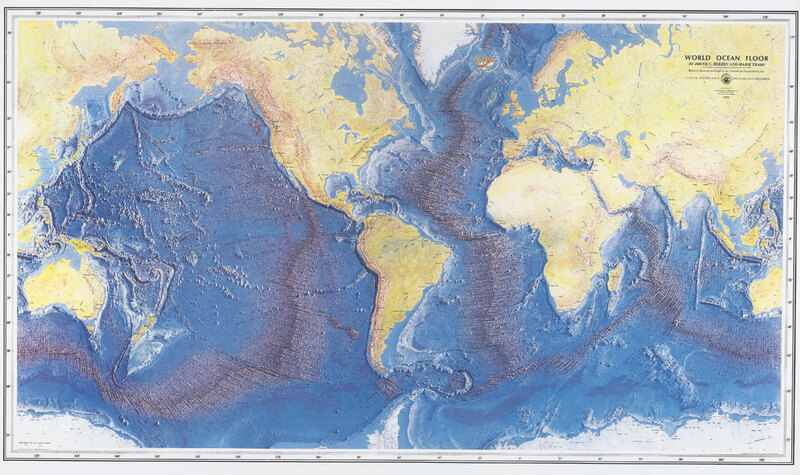 And then there were the ones that were finalists (Tharp ocean map is awesome, the USGS Volcanic Hazards poster is basically reproduced by students during intro classes, the different types of silicates), but in the end, I had to go for what I truly know — metamorphic thin sections. 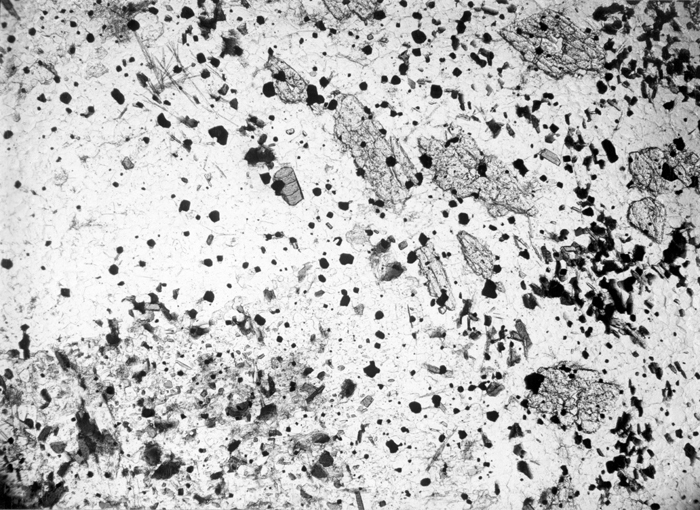 Though photomicrographs are gorgeous, to truly “see” what’s going on with textures, you need to draw them by hand. The old-fashioned pen & ink drawings draw your eyes to the key features — ah, for the days when every department had an in-department scientific illustrator. 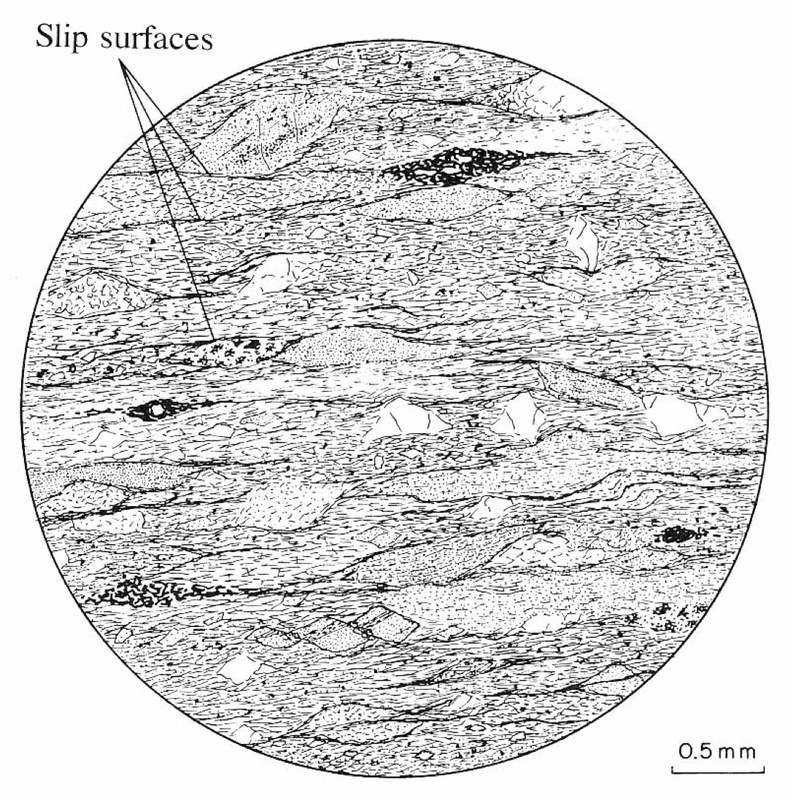 The following illustrations are of the progressive syntectonic metamorphism of a volcanic graywacke from New Zealand. 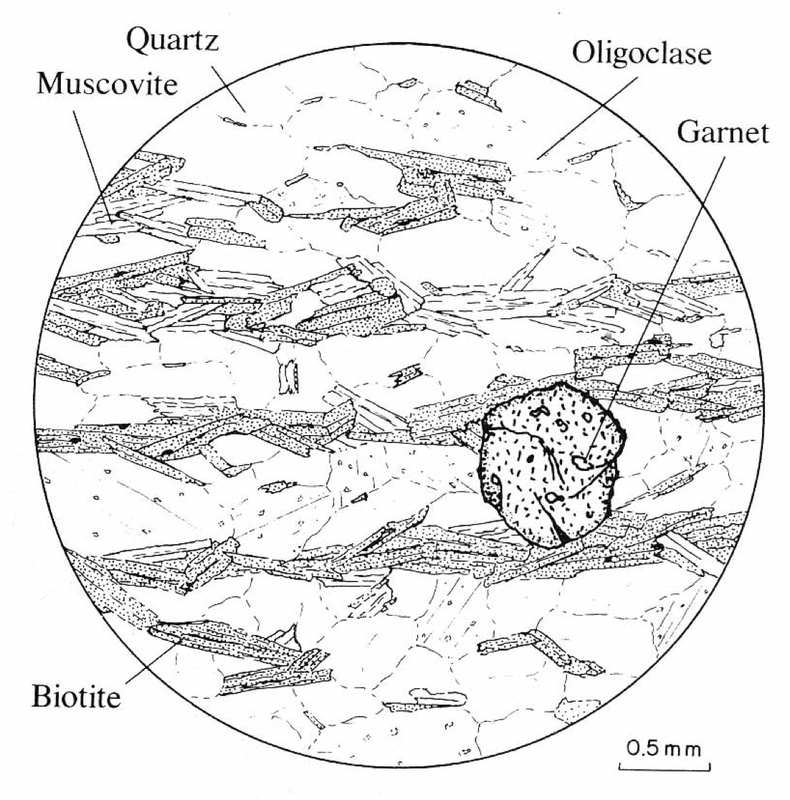 The original illustrations are from Best (1982): Igneous and Metamorphic Petrology (W. H. Freeman, San Francisco). My students don’t really appreciate my insistence that they have to draw fields of view during mineralogy & petrology, but the process really helps them “see” what’s going on so much better. And though most of them are not in the running to become scientific illustrators in the long run, I do really enjoy grading those labs. 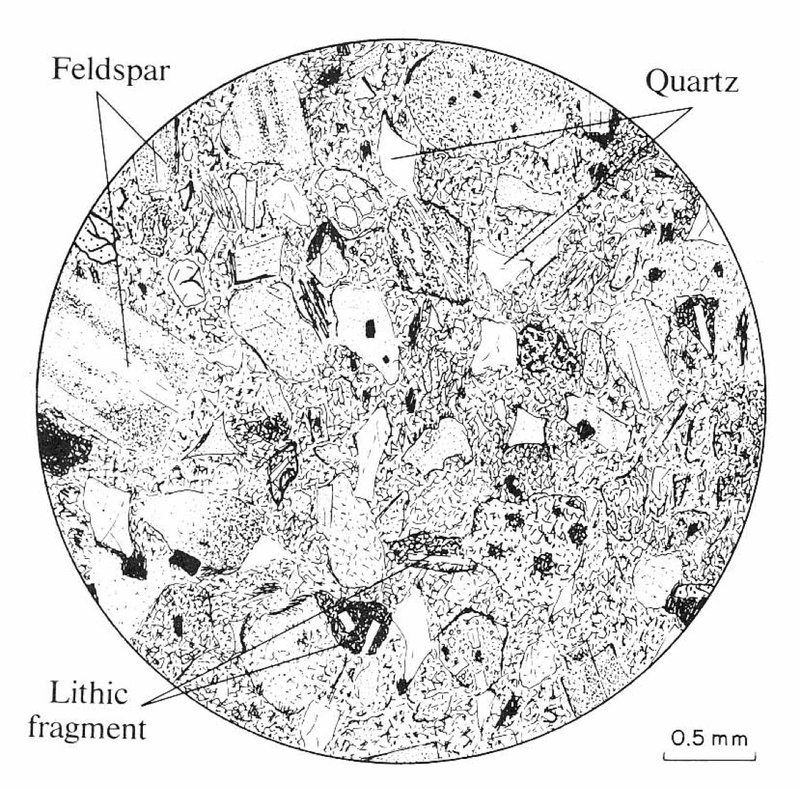 Starting point: at some period of time in the distant past, a collection of clays, small quartz grains (less than sand sized), maybe some carbonates and oxides collected in a relatively quiet sedimentary basin. If we were to sample the sediment, it would feel like mud in our hands (though it might be slightly gritty if we tasted the seds). What this boils down to is that our quiet depositional environment seds are Si + Al + water-rich with some K, Ca, Na, Fe, Mg, CO2 mixed in. Whatever minerals are going to be stable in the future of this rock, they’ll probably be Si + Al-rich. The first event to occur is more sediment being deposited on top of “our” seds. 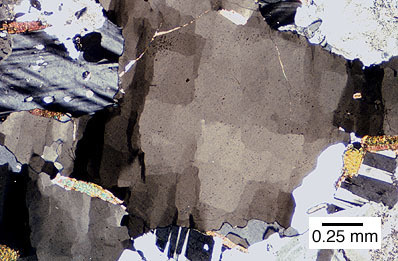 This new weight forces compacts the seds, driving off some water +/- carbon dioxide, reducing the porosity of the rock, and increasing the density. 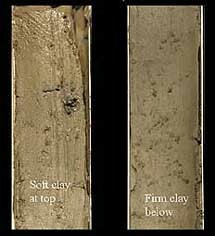 If you look at the image above, the clays on the left are “looser” and on the right “denser” due to their placements (towards top & towards bottom) within the core. As more & more sediment is deposited in the basin, our seds are compacted more & the temperature starts to gradually go up simply due to burial. More than driving off water, though, some of our clays (and some of the other random minerals such as goethite, aragonite, etc.) become unstable. At this point, usually the clays are replaced by other clay minerals that are slightly more dense and contain a bit less water. 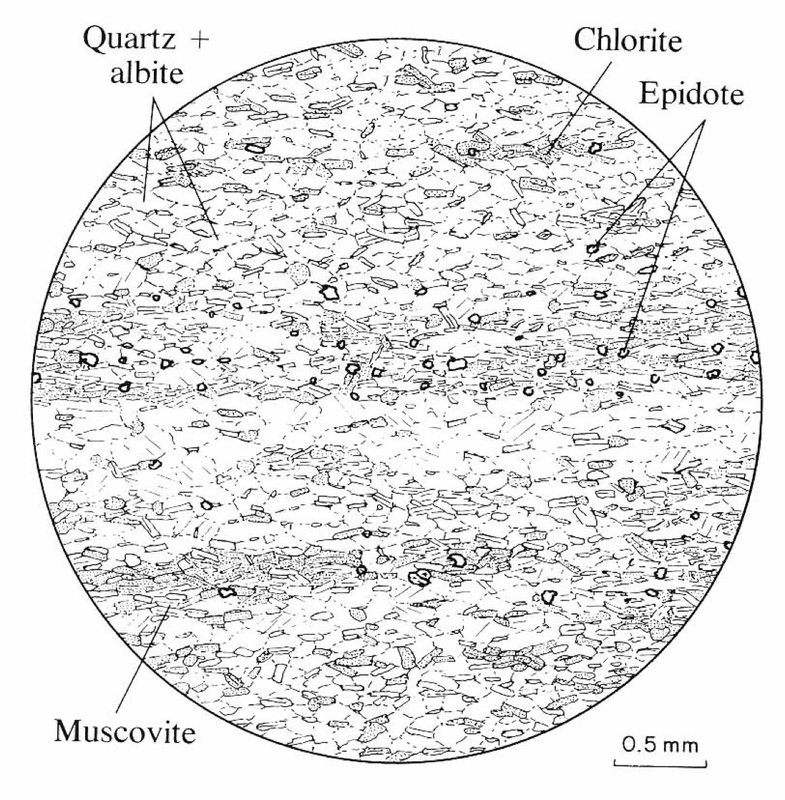 If aragonite was present, calcite may form. Goethite would be replaced by an anhydrous oxide such as hematite. 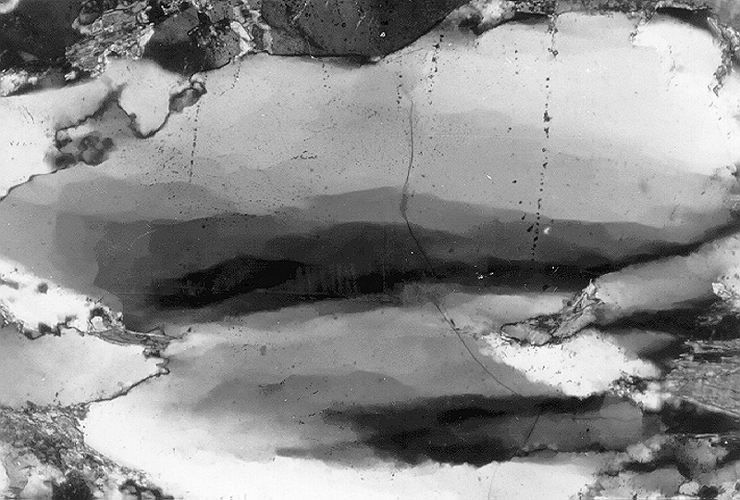 The further compaction, driving off of water / carbon dioxide, and recrystallization of some of the phases takes our loose seds and turns them into a sedimentary rock–in this case, a shale. 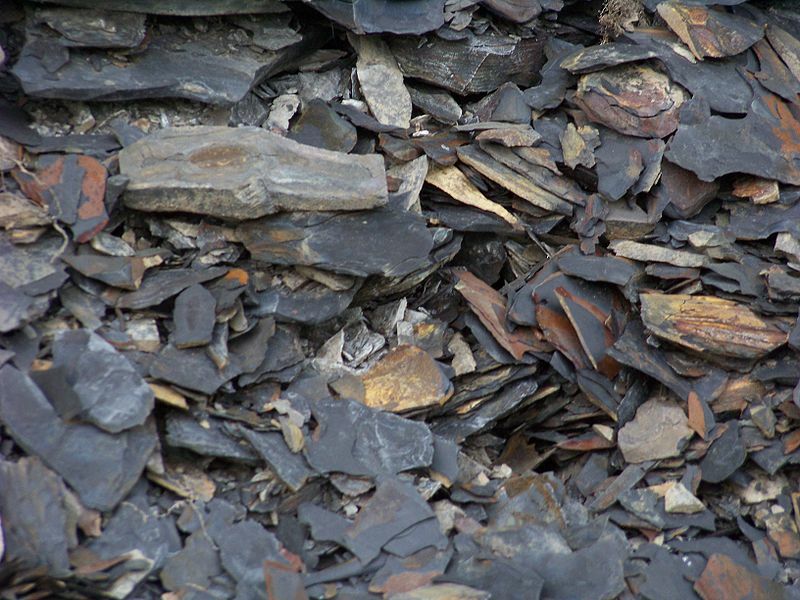 Shales are still very, very fine grained so that individual minerals are not visible to the naked eye. They are also “fissible” or form in thin layers along which they are easy to break in relatively smooth planes. If our basin simply continues to fill, our shale may lose more water / carbon dioxide, but it won’t become “interesting” (at least to a metamorphic petrologist). 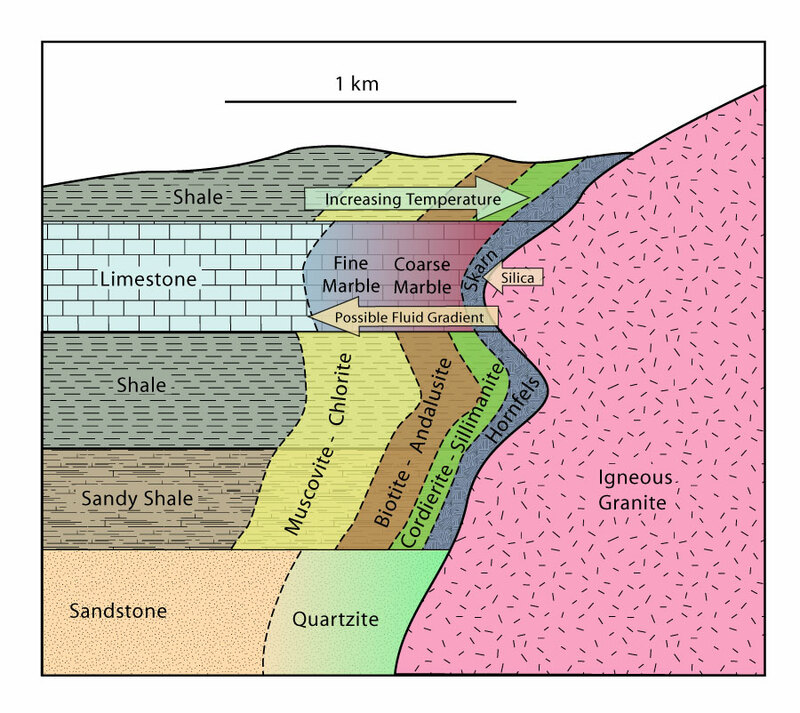 In order to take that next step, we need to either heat the rock by intruding a pluton (igneous body) next to the shale or involve the shale within an orogenic event that will increase both the P & T.
The rocks within the contact aureole will be heated up with higher temperatures near the igneous body & lower temperatures further away. Frequently, there is a minimal P change associated with the intrusion of an igneous pluton, but it may cause a differential pressure field. Normally the changes from unmetamorphosed to low-T contact metamorphism to moderate-T to high-T are gradual and may be difficult to pin down exactly to as easily identifiable line in the field. 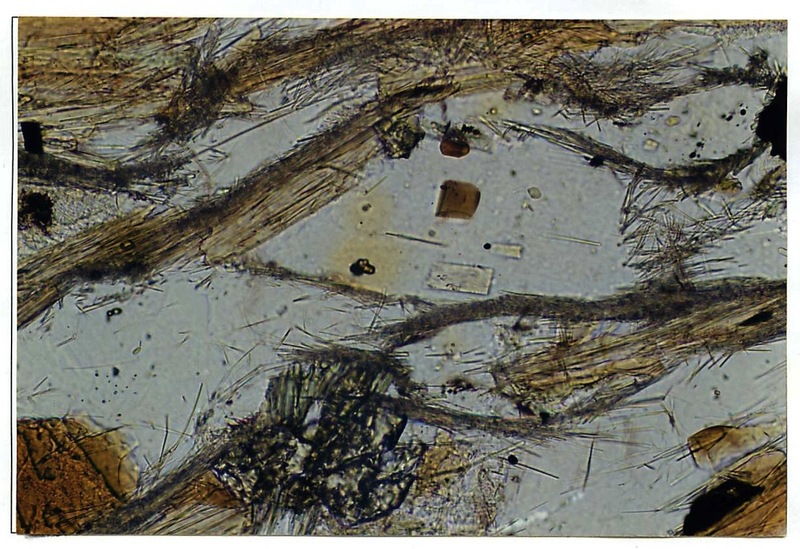 Detailed work with samples made into thin sections is usually need to pin down exactly where a new mineral becomes stable (in-isograd). 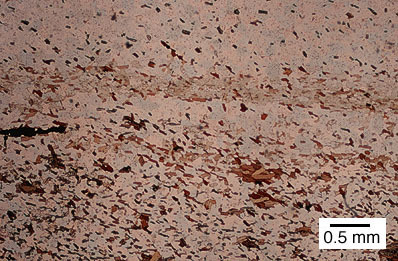 The rock may either be unfoliated (no alignment of the grains due to a differential stress) or foliated. As the temperature continues to go up, the rock become more & more anhydrous and instead of micas (chl, bt, mu) either anhydrous minerals (e.g. 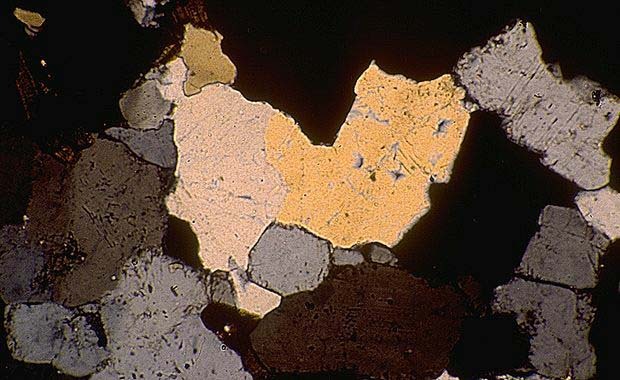 plagioclase, andalusite, garnet, sillimanite, K-feldspar) or minerals with only very low amounts of water (e.g. 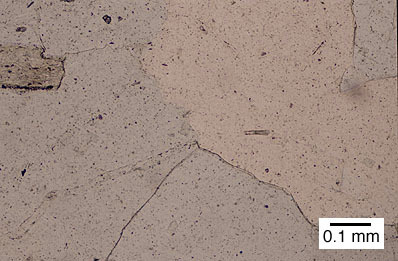 cordierite, staurolite) become stable. Note the increase in grain size below. Last week’s mineral of the week was quartz. The optical properties for quartz are fairly simple and, unfortunately, overlap with a number of other minerals. In plane light, quartz is clear and has low relief. 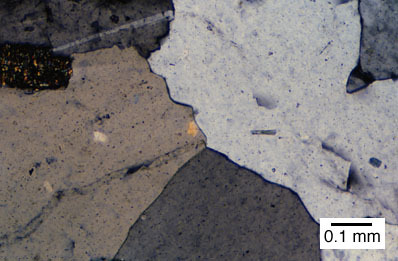 In crossed polars, quartz has 1st order whites to greys. Ok, so what could we mistake it for and how do we avoid that? What are you’re options if you happen to be a metamorphic petrologist? 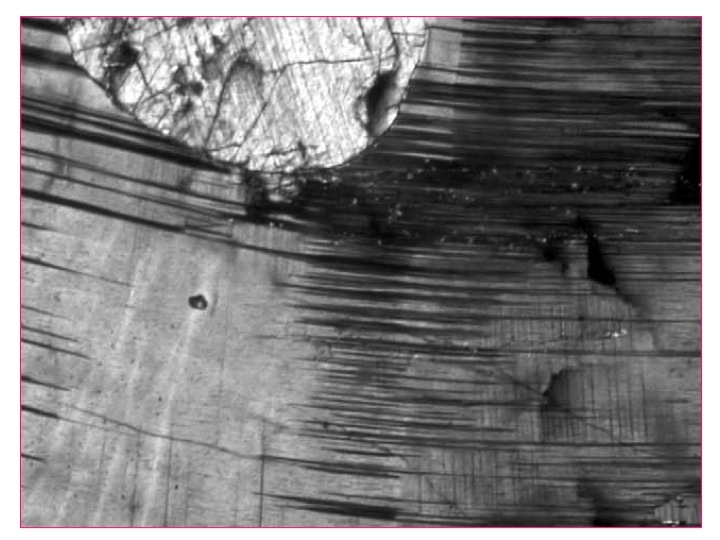 Oh, and if anyone has a good link to a core-rim metamorphic plagioclase zoning picture, please leave me a comment!